I know exactly what you were just thinking: 'I wonder if vegbee could show me exactly how to make a dashiki?' Isn't it freaky how intuitive I am with these things? Yearn no longer! My daughter's preschool is doing an Africa theme over the next few months, and her teacher asked if I could make up a few garments to support their theme. So, I did. One of the things I like to do when I learn how to make something new is to attempt spread the method about, somewhat like influenza. The basic shape of a dashiki is an A-line with wide bell shaped sleeves. 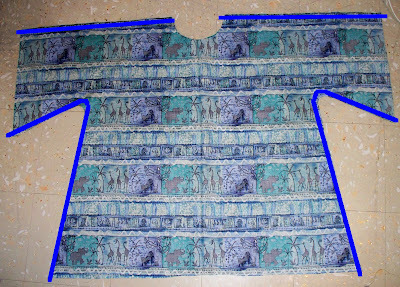 Since unstretchy woven material is used (cotton, linen, or such), the neck has a slit in it vertically on the front to allow the head to actually get in. If you mark the point where measurements B and C connect, then you can draw a gentle A-line out from that mark for the bodice, and a bell type curve for the sleeve. Marked on the square is the actual part of the curve that is typically used as a neckline curve by people who actually know what they are doing (how I envy them). 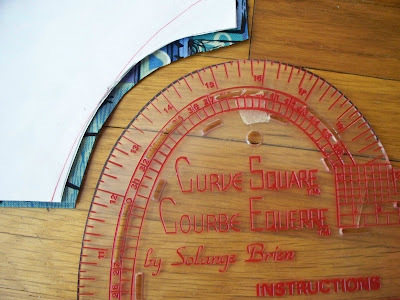 The curve square will also do arm hole curves and all sorts of standardized measurements for our curvy bodies. Since I figured out how they work, I use mine all the time. If you scroll back up to the picture with the main pattern piece, you'll notice a smaller sickle shaped piece just above it. That is the facing pattern piece for the neckline. 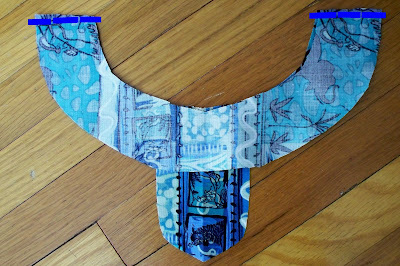 To make one, trace your neckline curve, and make another curve above 1 1/2" below. Add a sticky down yoke bit (stop me if I'm getting too technical) about 3" long to support the slit in the neckline and you are off and running. 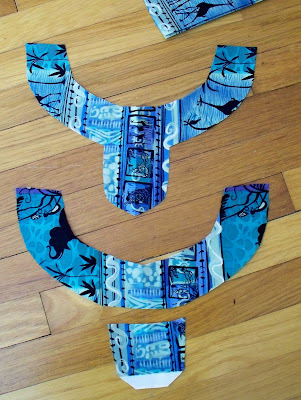 Cut two dashiki pieces on a length-wise fold from your newly minted pattern. 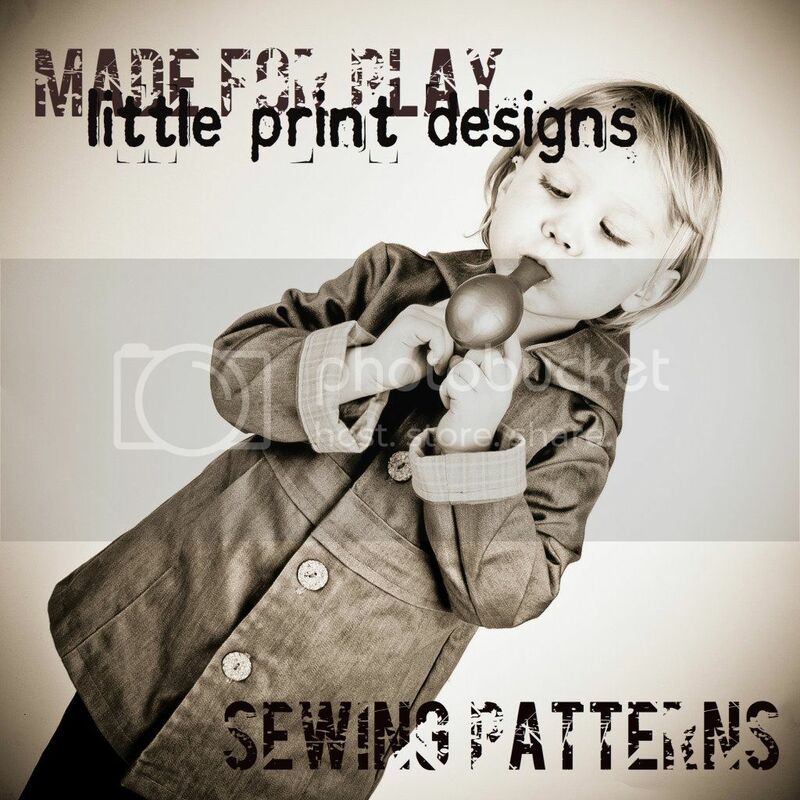 Note: Your pattern does not include hem or seam allowances, you must add them when cutting. Cut two neckline interfacing pieces from the same material. Add seam allowances to the end of the curve. Since we do not actually need two sticky down yoke things, cut off one of the dingles on one piece to serve as the facing on the back of the neck. 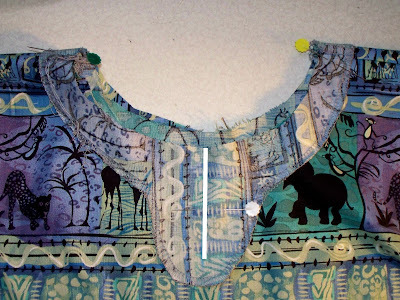 To sew the dashiki, put the two pieces right sides together and stitch along the top of the shoulders and along both sides, like so: Hem the bottom of the dashiki and the arm openings. 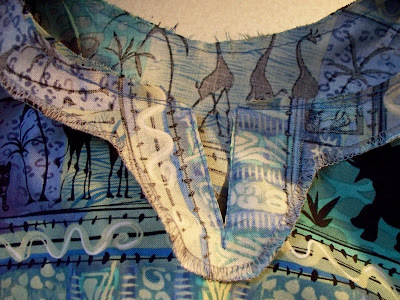 To sew on the neck facing, align the shoulder seams with the seams on the facing right sides together. Pin the whole thing in place. Using chalk or washable marker, draw a line down the centre of the sticky down part from the neck to about 1/2" from the bottom. This is to be the place where we will slit open the neckline. 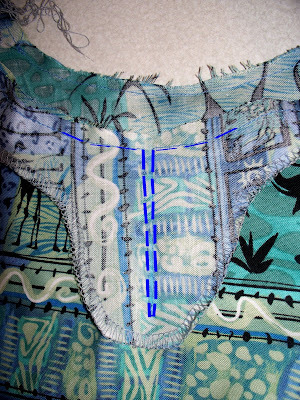 Stitch around the neckline, joining the dashiki and facing. When you encounter your marked line, stitch down one side of the line coming to a point at the end and then (with your needle in the fabric) lift the presser foot to swivel the fabric to stitch back up the other side of the line. Try to make your stitches only 1/8" or less away from your first line going down. A word of caution. Do not back stitch or bunch up your stitches at the point. The less stitching in the area, the nicer the point will be in your opening. 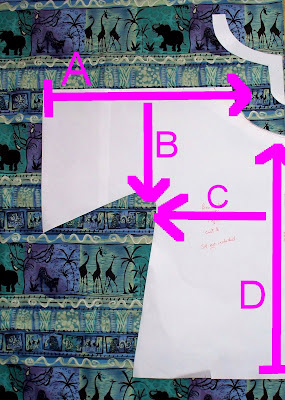 Cut your fabric from the neckline to as far as you can go along your marked line. Be very careful not to cut your stitches. 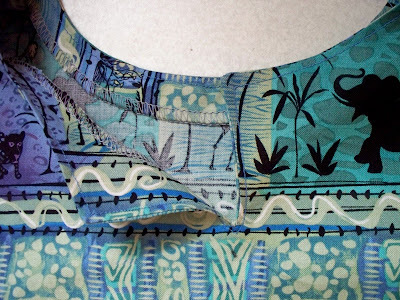 Clip the corners at the top of the neckline slit and turn the facing inside the dashiki, wrong sides together. Press the neck line flat. Top stitch around the neckline at about 1/8". Oooh, this is excellent! So intuitive, yet so useful. I saw some gorgeous African-style prints at Walmart yesterday. Love it-thanks! Can't wait to try it out...you're awesome. You know that right? I love this, my kiddo is a Montessorian also, so I understand the lengths that a mom will go to to help out with that process. 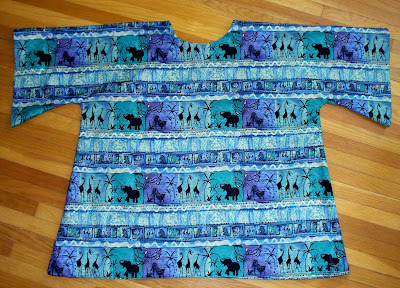 I have some very similar fabric with safari animals on it so I will have to try this out for her. I was also thinking it would make a cute swimsuit cover up. Thanks all for the encouraging comments! woo hoo! I like your blog!! I'll have to try this for my baby! Thanks! Hey Thanks! I have made these out of old beach sarungs-but the neck was always a problem. You gave an easy to understand and do neck! Thank You. 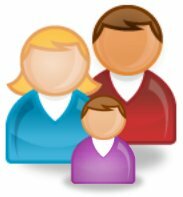 You and your family rock! 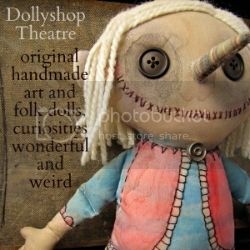 This is an awesome blog. You bring so much joy into my life through the things you do. Keep up the great work. Awesome shirt and tutorial. Thank you so much. Bookmared it for later use. Thank you! Do you have ANY idea how hard it is to find a pattern for this in plus sizes? I've bookmarked this page. Hi, i really want to try this one on my 1 year old girl, but mmm im having trouble..i have that same curved ruler..is just that i dont know how to use it ..
would you please explain me ..how or when to use it? a french curve ruler gives you nice people shaped curves. On my ruler it actually gives you the measurements to use for the different parts of a garment (arm curve, neck curve, etc). 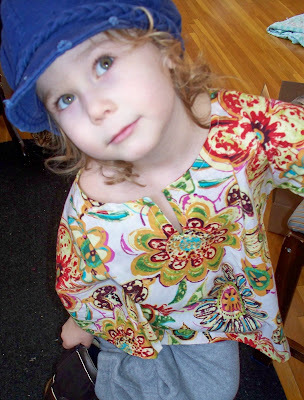 I think it might be a good idea to explore this topic later in a tutorial, since it is really helpful when resizing patterns, another topic I'd like to cover more completely, but for this project right now I suggest you find a well fitting shirt already in your daughter's closet and use that as a guide for the neckline. I hope that helps, and I will definitely revisit this topic sometime as a tutorial. In the meanwhile, some web searches may be able to help you out with how to use the curve square. Oh lobe it! Great tutorial. I could SO see one of these longer, in a sheer gauze as a swinsuit cover up, or what about just making one sheer to wear with a lacy tank? Perfect for the beach or a humid summer evening to keep from becoming a feast for the skeeters! Thank you! I'm going to try the neckline out for a shirt for my ds - he has a HUGE head and a tiny body so its hard to find shirts that work! This is great. 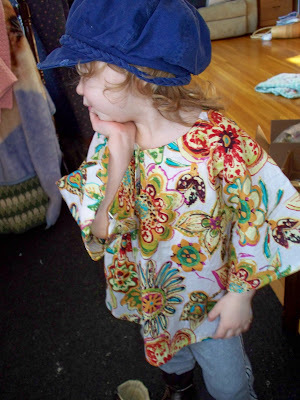 It would make a super dress as well as a top, and the instructions convert easily enough to adult sizes too! Thanks. hi, thanks for the wonderful tutorial! the technique around the neckline is so simple that for the first time i got a nice and neat neckline. But i think i got my measurement for B wrong. i measured my daughters arm hole and it was 15, so i took B=15*.75=12, now i have a big hole around the arm.pls tell me where i went wrong!